This spacious home, on beachfront with glorious views, is designed for a large gathering of family and/or friends. The main living area, warmed by heart-of-pine bead-board and flooring, has five sofas to accommodate hanging-out and visiting. Antique dining table seats 10-16 with four stools at the adjoining kitchen counter/bar (plus a high chair for tots). Both areas look out over the set-down screen porch with tables, chairs, rockers, hammock, and sundeck onto the beautiful white beach and ocean. You are just close enough to see dolphins frolick from inside the home. Pool safety with small children concerns us, so we stick with the shared pool close by instead, and keep mini sun shade pools, 62x62x48 for guests to set up on deck if they choose. Also, our GOLF Cart is a fun way to scoot about the island. Designed for congregating, this home also offers individual privacy. Each of the bedrooms has its own HDTV with cable, four of these have ocean views and three have doors onto the upper level deck. The large kid's room has been painted to resemble an aquarium. It has two sets of bunks with trundles under each. We are set up to very comfortably accommodate 10 adults with 2-6 children, or 12 is our FIRM MAX for ALL-ADULT GROUPS, for your comfort and our home's safety. Free private XFinity WIFI and digital cable TV. The underneath of this home is a grill-out, hang-out, play area, white washed and open-air, 14 ft ceiling. It has a gas and charcoal grill, a tiki bar area, ping pong table, hammock chairs, GOLF CART, and various outdoor/beach games, as well as outdoor table and chairs. We keep 8-11 or so beach/sand chairs (along with the resin adirondacks that are great for beach), a large cooler, and an awesome all-terain Wonder Wheeler to tote your things across your private boardwalk and down the dune. I also have info for a service that will set you up with wood and canvas loungers and umbrellas each morn. Call or email to ask about our pool access. OCEAN BOULEVARD'S OCEANFRONT HOMES ARE THE CLOSEST LEGALLY POSSIBLE ON THE ISLAND. 6 twin beds in kid's room (2 sets of bunks with trundles; plus a port-a-crib for tots). Main floor King master is full en suite. Bed linens and bath towels can be provided. We use 100% cotton linens, and 100% cotton cover, top-line hypoallergenic pillows in all rooms. Bear in mind please that 100% cotton wrinkles, and sunbathing products stain terribly. Sheets and towels are certainly guaranteed clean, but not free from such small product stains. You may rent linens from a service if preferred, or bring your own. We now have a golf cart availble for use by licensed drivers only, with signed waver! We choose this specific spot to build for the closest legal proximity to the beach (20 yds down our private boardwalk), safe swimming areas, and non-crowded privacy from the commercial area, a 3/4 mile walk. Private Chef - Ask about Tsamin's awesome Lowcountry dinners feeding 11-15, delivered to the home with 48 hour notice for a perfectdinner in. You are 3/4 mile walk or drive down the beachfront to the Banana Cabana, Long Island Cafe, Coconut Joe's, Acme Lowcountry Grill, and many great restaurants. 3/4 mile the other way to The Boathouse Restaurant on Breech Inlet. The world famous Windjammer beach bar offers up live entertainment. While enjoying the Island Life, you can go swimming, body surfing, play volleyball, dine at oceanfront restaurants, bike the beaches, jog, cruise the intercoastal waterway, sail, surf, windsurf, take in some live music, shop the boutiques. Check out the scuba diving or go deep sea fishing. Relax at a spa or try horseback riding. Kayak, parasail, water-ski, fish, go 'Crabin or Shrimpin,' walk the beach for shells, take a sunset cruise, charter a small boat, explore uninhabited islands, play some of the South’s finest golf courses. You are only ten miles from the Historic District of Downtown Charleston. Take in the charm of this beautiful city and learn more about Charleston on a horse-drawn carriage ride, or tour Charleston Bay and Fort Sumter by boat. South Carolina Aquarium, world class restaurants, the Charleston City Open Market and shopping galore, live theater, live music, museums, and more. You are just five minutes from Mount Pleasant Towne Centre: an upscale shopping experience in classic southern style. With over 65 national and local tenants, including: Banana Republic, Gap, Bath & Body Works, Caché, Men's Wearhouse and Old Navy, as well as the regions only J.Jill, Coldwater Creek and Francesca's. Sample exquisite home-made candy at Sweet Julep's Candy & Gifts, or dine at PF Changs, 5 Guys Burgers, Longhorn Steakhouse, TGI Friday's, Atlanta Bread Company, - there is sure to be a culinary diversion to suit your palette. After dinner, stroll the lush, tree-lined streets or relax at the luxurious Palmetto Grande 16-screen theatre. Ten minutes away you'll find famous Shem Creek shrimp boats and seafood restaurants. The Yorktown WWII destroyer and several historical plantations are all within easy driving distance as well. Again, We are set up to very comfortably accommodate 10 adults with 2-6 children, or 12 adults. Isle of Palms now strictly enforces their CODES which limit the number of guests in all rentals. We may only exceed 16 guests for children 2 years or younger. Guests risk a fine for violating Codes. ( *We also have a small oceanfront condo that sleeps up to 5 - 2/3 of a mile up the beach for small groups or additional guests. See - 'All My Rental Listings' below for links. We have a large 2BR townhouse 1 mile from Sullivan's Island beach and 6 miles to downtown for fabulous rates, as well as a 1BR (king bed)/1BA next door to that which sleeps up to 4. Please ask about the great rates and availability. Private chef services are available. Ask for more info. Please note: We provide a lmited amount of start-up paper goods, soaps, etc. Our cleaners provide quality basic linens. Some guests prefer to bring their own for maximum comfort. Extras are also avaiable for rent from our cleaning service, or several independant ones in the area. The underneath is cleaned regularly, but not in between every weekly Summer use and wil likely have sand and dirt, etc, like a yard outdoor area. Also grills may have some gas, but it is possible you will need to get a refill, plus your own charcoal, as we do not regularly supply those items. The full deposit will be returned if a CANCELLATION is made 90 days prior to the reservation. 50% will be refunded for a cancellation 45-90 days prior. 100% minus $100 handling fee will be refunded in any case, if the spot can be filled after cancellation. A serious threat of hurricane (actual hurricane warnings for the Charleston area in the next 48 hours) would constitute a 100% refund. It is standard practice to have guests empty trash, as they may have stinky stuff (diapers, seafood, shells...) which permeates the place when not cleaned for hours, or occasionally the next day. My name is Susan Player Verbsky; a wife and mother by God's Grace, a Psychotherapist by training, with a small practice here for 20+ years, and a Real Estate investment and management specialist by design for the same time period. I enjoy the great intangible rewards of Therapy, and, equally, the tangible rewards of developing a property and working with people planning vacation time. Our family built this house after many years of family trips renting homes up and down the Carolina Coast. We choose this spot on IOP for its exceptionally beautiful and safe beach, proximity to ocean, and as well to all that Charleston has to offer. We then endeavored to incorporate all of the do's and dont's we learned in the many beachfront homes we had rented. ** Smaller groups and families may want to look at our small beachfront condo 2/3 mile up the beach, our 1BR (king bed)/1BA 1 mile from the beach and 6 miles to Historic Downtown, our large townhouse next door to it. Standard glass. No natural gas here at the beach. Dining table can seat 16, but we have it set up for 12 with 4-5 barstools at breakfast bar. There are 4 more dining chairs spread around. Available for rent on the island, jetskis as well. Available for rent on the island. We fit all but a few specialty chairs that are very wide. 7 TVs, All flatscreen TVs, Full Gourmet Kitchen, Two Refrigerators, Ice Machine, Two Jacuzzi Tubs in Bath, Covered Parking for one or two, Parks 8-14 Cars, WIFI, Ping-Pong Table, Bocci Ball Set, Horse Shoes, Volleyball Net, PRIVATE Boardwalk, Beach Shower, Port-A-Crib, High Chair, and stroller available, ! PETS NOT ALLOWED - SERIOUSLY - NO EXCEPTIONS !, NO SMOKING indoors, Handicap-Access. We enjoyed our time at this perfectly located home, the ocean is right at your door and the ocean views are fantastic. Lots of porches, and a big living/dining area that is great for families. Perfect for our needs. Beautiful home with unbelievable views. The perfect place to stay on the Isle of Palms. My family keeps coming back to 406 Ocean Blvd - it just has a "feel" that is sublime - from the heart pine wood scent of the interior that greets you, the sunrises seen from the porches or from the large picture window, the shipping channel and its activities, the lovely sea oats and purple fountain grass in the dunes, the immense feel of the beach, the star-filled night sky seen from the boardwalk.... need I go on?! Susan is a wonderful property manager and prompt in her response time. This is as good as it could get for us! 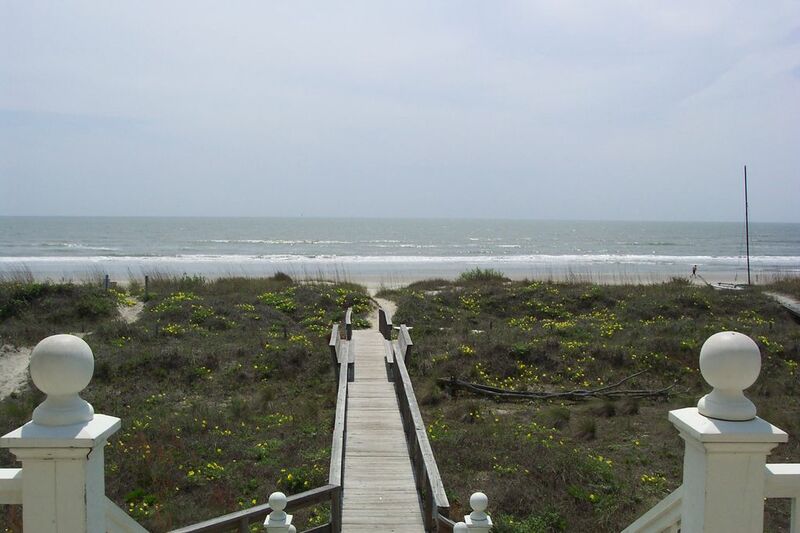 This property has an incredible location......super view and easy beach access! The home layout is wonderful.....it is spacious and handles a large group very well! We, however were very disappointed with the lack of cleanliness! We did very little cooking but some of the appliances did not work and were missing parts. The kitchen drawers had spilled food and the laundry room was poorly kept. It is a shame as this house is a real gem but the upkeep is lacking! We do have 1 burner out- new range on order. And, kitchen freezer drawer was sticking due to being left Not fully closed for too long by the guests. The drawer with spilled food is the spice drawer, with 20-30 spices not always closed well by guests. Some may prefer buying salt, pepper, italian seasoning, Old Bay, basil, +++ when renting. In 19 years, this was our 1st guest to take issue with that drawer. The laundry room is your basic laundry/mud room - functional, not 2018 HGTV. Cleanliness is always a priority; perfect order is not. As I try to state clearly in our description, we are a family designed, built, and frequently used beach home, with loads of books on shelves, a few personal items (we share), lots of magazines, games and toys, heart of pine flooring (w/ some scratches), bead board LR walls, and counters. If you prefer the sleek feel of granite, stainless, and orderly minimalist design, Please vacation elsewhere! The house itself is amazing. Vaulted ceilings, huge old doors, beautiful open kitchen and dining room, great light, huge beach front window, excellent patio space, lovely bridgeway to the beach, prime location away from the crowded beach section by the pier (but also close enough to walk to it), wonderful furniture arrangement in the living room- comfy and warm and also able to accommodate two different groups of people having two different conversations. Ample parking space, beautiful stair case in the front. Lovely hangout spaces outside- upper and lower decks and the bridgeway. I am so grateful for the golf cart, which we used to travel to and fro the other house that we rented. The ping pong table was also a nice feature. Also, thank you so much for providing chairs and beach toys. We didn’t need to rent anything. My cousins and I probably spent a combined time of 6 hours fixing and flying the fighter kite. So fun. What else... I think I’ve touched on everything. Ample rooms and bathrooms for everyone who stayed there. Everyone loved the house. Great great location. So I give it five stars all day. This was our first time to visit IOP but it won’t be our last. The house worked really well for our family. We had 14 including 5 children. The beach access was great and the gently rolling waves were great for the kids. No one was tumbled by heavy surf though we did incur a few jellyfish stings but that’s going to happen at the beach. We’ll definitely be going back again.